If the text you're using for general chemistry seems to lack sufficient mathematics and physics in its presentation of classical mechanics, molecular structure, and statistics, this complementary science series title may be just what you're looking for. 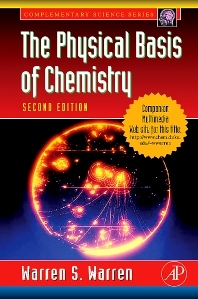 Written for the advanced lower-division undergraduate chemistry course, The Physical Basis of Chemistry, Second Edition, offers students an opportunity to understand and enrich the understanding of physical chemistry with some quantum mechanics, the Boltzmann distribution, and spectroscopy. Posed and answered are questions concerning everyday phenomena. Unlike other texts on this subject, however, Dr. Warren deals directly with the substance of the questions, avoiding the use of predigested material more appropriate for memorization exercises than for actual concrete learning. The only prerequisite is first-semester calculus or familiarity with one-variable derivatives. In this new edition, the entire text has been rewritten and keyed with an accompanying website, which contains instructive QuickTime movies on topics presented in the text to enhance student learning and participation.